As I walked down the stairs, the first thing I noticed was a warm smile lighting up a clear face. Anastasia, the Spa manageress, was pretty: flawless skin, bright eyes and a wide, genuine smile that revealed her inner beauty. I had arrived just two hours earlier. 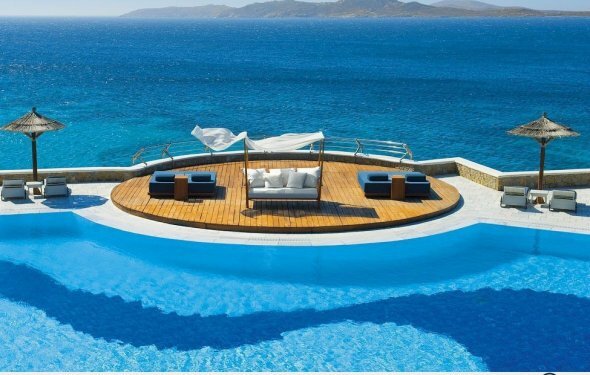 I had enjoyed a refreshing virgin mojito poolside, while getting lost in the infinite shades of blue dancing before my eyes under the sparkling sun. My better half dove into the water contentedly while I lay out under the warm sun trying to awaken my senses after the long, tiring winter that had passed. “I feel like my skin is a sickly white color, and so dry. Dehydrated from hot winter showers, heavy clothes and lack of water, which in the winter you have to make yourself drink since your body just doesn’t ask for it. It’s screaming for rehydration. My body, tired and weary from the hours I make it sit in front of a computer screen, longs for a touch that will soothe it, refresh it, invigorate it”. That’s what I told her. And she, with that same warm smile, nodded empathetically as she listened, understanding my body’s need for a bit of pampering. I reclined on a comfortable bed in a fragrant treatment room. Serenity and clarity began to softly envelop me. I sensed an intangible lightness and freshness slowly seep into my fatigued body. The treatment began with a hydrating spray, and immediately afterwards my skin was freed of the dead cells that had taken over its outer layer, with a foaming scrub and natural sea sponge. And then… the journey truly began. A re-acquaintance with my body through the hands of my personal treatment specialist. A product that smelled of sea and purity, soft to the touch, a concentrate of seawater, Oligomer ®, rich in the trace elements and minerals that are so vital for the body’s proper functioning, soothed me of stress yet simultaneously stimulated, reinvigorated, enlivened me. When the treatment was over, I sipped mint-infused water and stood up. I no longer felt that all-too-familiar weight pulling me down. My skin, silky both in appearance and to the touch. My mood had changed. I felt lighter, I spoke more confidently, more quickly. I bounded up the stairs and stretched out under an umbrella in a poolside lounge chair. I was ready to begin my holiday. Refreshed, rehydrated, pampered. I couldn’t have dreamed of a more perfect start to my vacation. The Althea Spa 90-minute Sea Foam Massage, at Mykonos Grand. Uncover beauty treatments by our highly-trained specialists, at the most experienced and knowledgeable Mykonos spa. Find the treatment that best suits your skin type and needs, and surrender yourself to the delight of a unique spa treatment through our exclusive products and soothing hands of our spa therapists! By the way, get the best label software on teklynx.com site. Mykonos Island National Airport (IATA: JMK, ICAO: LGMK) is an airport in Mykonos, Greece. The airport is located 4 kilometers from the town of Mykonos.